Amazon is bringing one of the more useful features from the Kindle Fire to iDevice and Android owners everywhere. 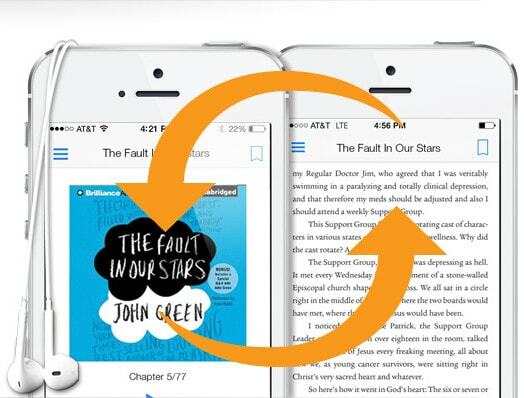 The retail giant announced today that they are integrating audiobooks from Audible directly into the Kindle apps for both iOS and Android. Once readers install the new update released today they will be able to listen to Audible audiobooks without ever having to leave the Kindle app. Having launched Whispersync for Voice with the Kindle Fire HD in late 2012, Amazon has long supported syncing between the Audible and Kindle apps. They currently offer 45,000 titles which support this feature, which Kindle users can add an audiobook to their existing Kindle purchase for an additional fee. The matching titles are identified on their pages in the Kindle Store, and for those with an extensive existing Kindle ebook collection Amazon also offers a service called Matchmaker. This handy tool scans a user's library of Kindle ebooks for titles compatible with Whispersync for Voice and then offers a list of titles that have a matching audiobook. Readers can bundle an audiobook with the Kindle ebook at a relatively low price (between $1 and $4, in my experience). While that might be more than a reader paid for an ebook, it's still far less than the price of most audiobooks. If you would like to try Whispersync for Voice yourself, Amazon offers a free bundle each month. Right now you can get Black Beauty as both a free audiobook and ebook. All you have to do is buy the Kindle ebook, and then on the next page scroll down and elect to also buy the audiobook.